My Friend Rainer Needs Our help. Miami needs more nudes! He is German, and impatient- so he needs help now. Even five dollars would be great! But on a serious note– he is almost as badass as the Crazy Nasty Honey Badger, so please help. If you cannot donate please repost, resend– and REPEAT! The project will ultimately consist of 25 sculptures of Climbers randomly placed on the support columns of the Metrorail. Each Climber is welded in stainless steel, powder-coated in various colors, and installed permanently. 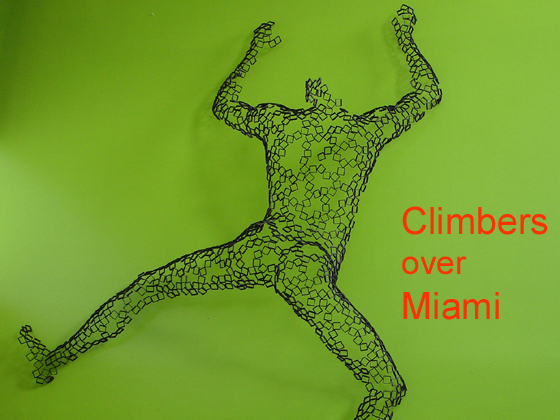 My Project “Climbers over Miami” has only one purpose, giving people something to smile about. It’s a public installation that, by its nature, will draw your eyes to the mysterious climber.